Since my last posts on Serverless, Serverless has gone 1.0. In fact, as of this writing Serverless is at version 1.3. I’ve had the luck of taking 1.3 for a spin with my new job by implementing an application for the Amazon Alexa platform. Alexa has a really nice integration with Lambda and we’ve been using Serverless to do our Lambda development. Our development pace has been insanely high and much of that can be attributed to Serverless. The 1.x versions of Serverless is drastically different than the 0.x versions I previously wrote about. In fact, I believe it was a total or near-total rewrite of the library itself. With such a drastic change I’d like to do another walk-through starting from scratch and ending up with a working application. In addition to changes in the Serverless library comes with changes and huge improvements in API Gateway and Lambda themselves. The great news is that authoring a service with these tools is getting even easier. Now, I can easily inject these into my Docker container using --env-file .env. If you are running on your local system you’ll need to have these two AWS variables set. See the Serverless docs on credentials for more details on AWS credentials if you need it. I’ll leave the Slack setup to you…but the long and short of it is that you’ll need to add a new “Slash Command” and plug in the API Gateway URL once we have it. Now, on to the Serverless! Serverless: Generating boilerplate in "/code/dilbert"
Serverless: Successfully generated boilerplate for template: "aws-python"
This is very similar to previous versions of Serverless and much different at the same time. Previously we would have received a higher level s-project.json and s-resources-cf.json files. Crack open serverless.yml and you’ll see the details on how your function and endpoint(s) are configured. First, let’s tune back the memory and timeout…we’re running a very small Lambda function so we can tune these both back to some pretty small values. In order to wire something up to our Lambda functions we use the functions block. What is nice here is that we can now define multiple functions inside of a given “service”. In prior Serverless versions a single function was a bit more self-contained and it was hard or unclear how to define a “service” vs a “function”. Now, it’s much more clear…we have created a Serverless “service” which can be made up of one or more “functions”, all sharing the same resources (which we’ll get to later). It’s important to note here the handler is really just pointing to handler.py. handler.hello then is just telling Serverless to setup a Lambda function which invokes the hello function in your handler.py file. Again, quite simple. Serverless is going to take this and create an API Gateway endpoint which responds to GET requests at the root. This is fantastic. Previously getting query parameters from Gateway into Lambda was quite tedious and much more complicated than it should have been. Now, we get this out of the box which is really what we should all expect. 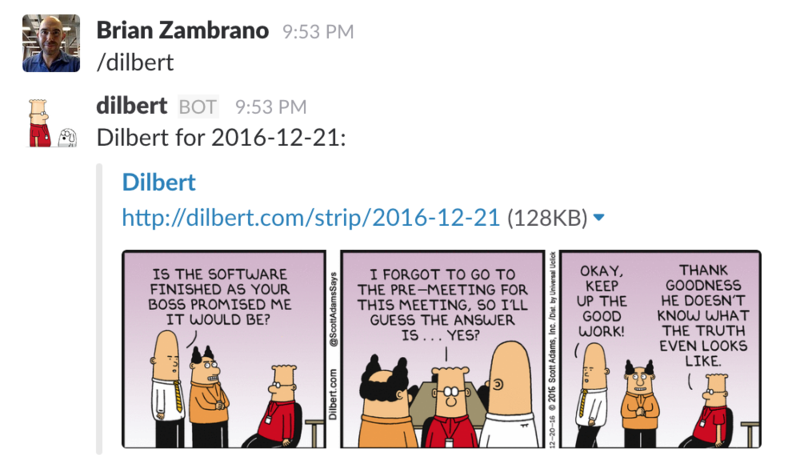 Now that we have the boilerplate (mostly) out of the way we can focus on our actual Dilbert application. I won’t cover the details of it, but instead show the finished product based on our little spec above for the Slash commands. Here are some highlights of how this is implemented. In our handler.py file we’ll now implement a function called dilbert which will accept the same two parameters as the hello function, the http event/request and the request context. This function will contain all of the logic to parse the request text from Slack and figure out what to respond with. The details on how to do this are really details around Slack, not details about Serverless. If you’re curious about the details you can simply read the handler.py source. In order to reply with a nice Slack message we’d like to embed the comic’s image in the Slack response. 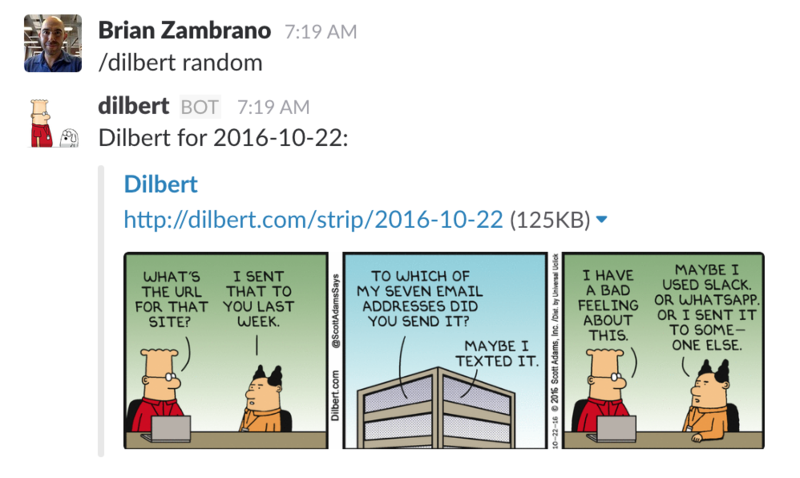 This requires parsing the dilbert.com page for a given day and extracting the image’s URL. For performance reason’s, it’d be nice to cache this value…so let’s put the image’s URL in DynamoDB! Because Serverless uses CloudFormation to create your service it’s possible to create and manage arbitrary AWS resources such as DynamoDB. For our purposes, we’d like to create a DynamoDB table to cache image urls when we create our stack. This is very cool. During any sls deploy command Serverless will manage this DynamoDB table for us, whether that be creating it on the initial sls deploy or updating it if we change any of its attributes. Once this is all setup we can now do another sls deploy. Serverless will set up our DynamoDB table and update our Lambda function appropriately. The redeployment goes much quicker if you only deploy the actual function/application code to Lambda. A full sls deploy will manage the entire stack/service through Cloudformation which can take a few seconds. On the other hand, sls deploy function -f dilbert will simply upload the current version of handler.py and supporting files to Lambda. This takes just a few seconds at most. Serverless 1.X is much improved over the 0.X versions. I have found it to be much easier to use especially when collaborating with other developers. The notion of a “service” makes a lot of sense and allows for better organization and sharing of resources. Finally, the ability to create and manage arbitrary AWS resources allows us to quickly and easily deploy a real stand-alone microservice. This post didn’t talk at all about Serverless “stages”, but using “stages” in effect let’s us manage different stacks for “production”, “dev”, “staging”, etc. This is the equivalent of having a staging server vs production server in a typical web application deployment. Serverless continues to make huge strides forward and I’ve already been able to move quickly on a few different projects. I’m excited to see what’s coming next in Serverless to make application and microservice development even easier.